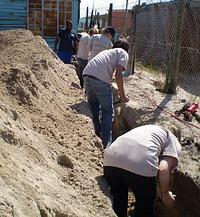 Last week Projects Abroad volunteers on programs in Cape Town gave up their weekend to work with the housing charity, Habitat for Humanity. 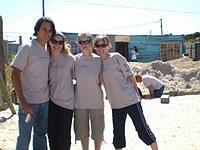 The volunteers spent the weekend helping to build homes in the impoverished townships outside of Cape Town. With shovels and spades, they dug trenches for house foundations, mixed concrete from scratch on the pavement and poured the concrete into the trenches. As with all Habitat for Humanity programs the volunteers worked hand in hand with the future home owners and others from the surrounding community. Blisters and sore muscles were worth the smiles and happiness shown by the family with a new space to call home.